Johnny Saunter held hoff his teammate to win Friday night’s truck race in Dover. 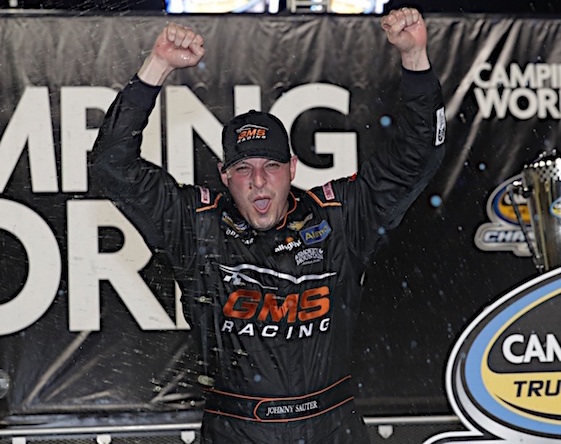 Defending series champion Johnny Sauter collected the Camping World Truck Series victory at Dover International Speedway on Friday night, beating teen-age GMS Racing teammate Kas Grala to the finish line by .270 seconds. Key to the victory for Sauter, who leads in series points, was crew chief Joe Shear Jr.’s decision to bring the 39-year-old Sauter to the pits under caution on Lap 118 of 200. The victory, which followed three straight second-place finishes, was Sauter’s first of the season, his first at the Monster Mile and the 14th of his career. “Johnny Sauter is a veteran and a champion for a reason,” said Grala, who took plenty of solace from his runner-up finish. (11) Johnny Sauter, Chevrolet, 200. (16) Kaz Grala #, Chevrolet, 200. (12) Grant Enfinger #, Toyota, 200. (6) Ben Rhodes, Toyota, 200. (4) Austin Cindric #, Ford, 200. (14) Brandon Jones(i), Chevrolet, 200. (18) Regan Smith, Ford, 200. (21) Justin Haley #, Chevrolet, 200. (8) Noah Gragson #, Toyota, 199. (2) Ryan Truex, Toyota, 199. (13) Matt Crafton, Toyota, 199. (1) Chase Briscoe #, Ford, 199. (10) Harrison Burton, Toyota, 198. (5) Jesse Little, Toyota, 198. (9) Ross Chastain(i), Chevrolet, 197. (17) Cody Coughlin #, Toyota, 197. (25) Matt Mills, Chevrolet, 196. (24) Cody Ware(i), Chevrolet, 190. (28) Wendell Chavous #, Chevrolet, Accident, 118. (15) Todd Gilliland, Toyota, Suspension, 115. (7) Parker Kligerman, Toyota, Accident, 96. (20) John H. Nemechek, Chevrolet, Accident, 91. (23) TJ Bell, Chevrolet, Accident, 89. (26) Jordan Anderson, Chevrolet, Engine, 82. (3) Christopher Bell, Toyota, Accident, 35. (30) Norm Benning, Chevrolet, Brakes, 27. (19) Austin Hill, Ford, Accident, 22. (22) Stewart Friesen #, Chevrolet, Accident, 20. (27) JJ Yeley(i), Chevrolet, Vibration, 16. (31) Jennifer Jo Cobb, Chevrolet, Vibration, 12. (32) Todd Peck, Chevrolet, Electrical, 4. (29) Camden Murphy, Chevrolet, Brakes, 4. Average Speed of Race Winner: 99.133 mph. Time of Race: 2 Hrs, 01 Mins, 03 Secs. Margin of Victory: 0.270 Seconds. Lap Leaders: C. Briscoe # 0; R. Truex 1-47; M. Crafton 48-93; B. Rhodes 94-164; C. Briscoe # 165-167; J. Sauter 168-200. Leaders Summary (Driver, Times Lead, Laps Led): B. Rhodes 1 time for 71 laps; R. Truex 1 time for 47 laps; M. Crafton 1 time for 46 laps; J. Sauter 1 time for 33 laps; C. Briscoe # 1 time for 3 laps.